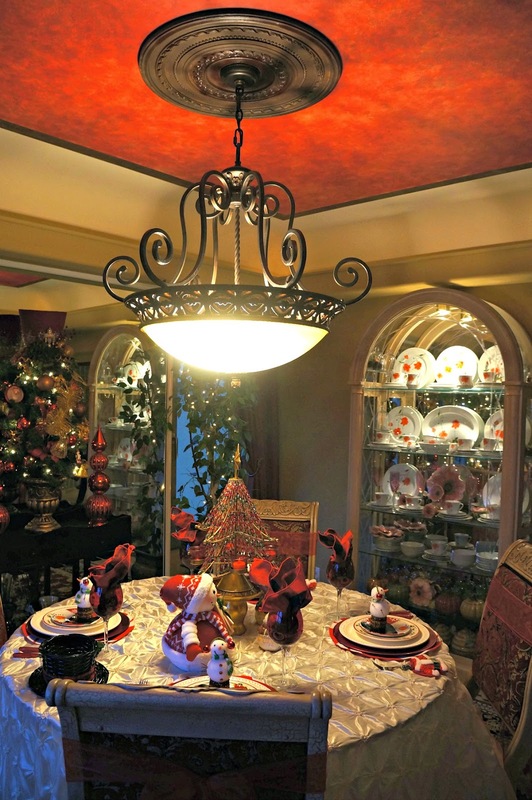 I started with the candy cane placemats, followed by red chargers and white plates by American Atelier. The snowmen salad plates are by Certified International. I found them at Overstock. Red goblets complete the table setting. 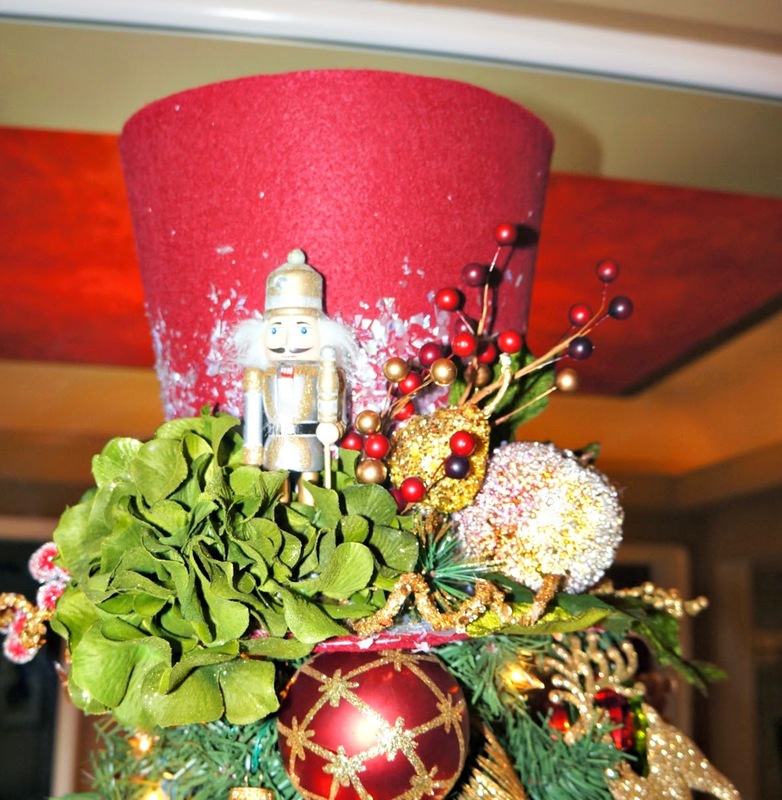 I am using my red flatware from Horchow, along with these cute little red Santa's britches and jackets. Christmas plaid napkins are a fun addition. The little snowmen are sitting on Christmas napkin rings. I found them at Big lots. Here's Frosty... I found him at Big Lots. This is our Breakfast room, formerly our dining room. 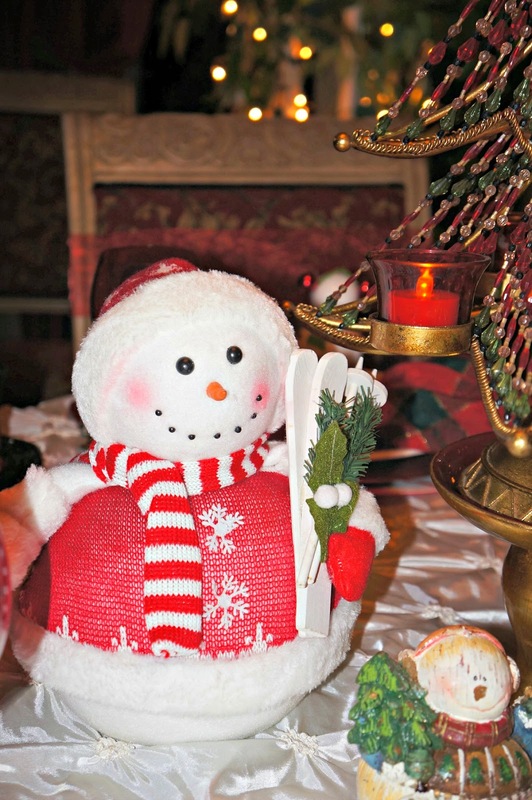 I also wanted to share a new Blogger, named Valerie from: Candle Light Supper2 She set a very cute Snowman table. They have any possible theme and even Mickey Mouse. 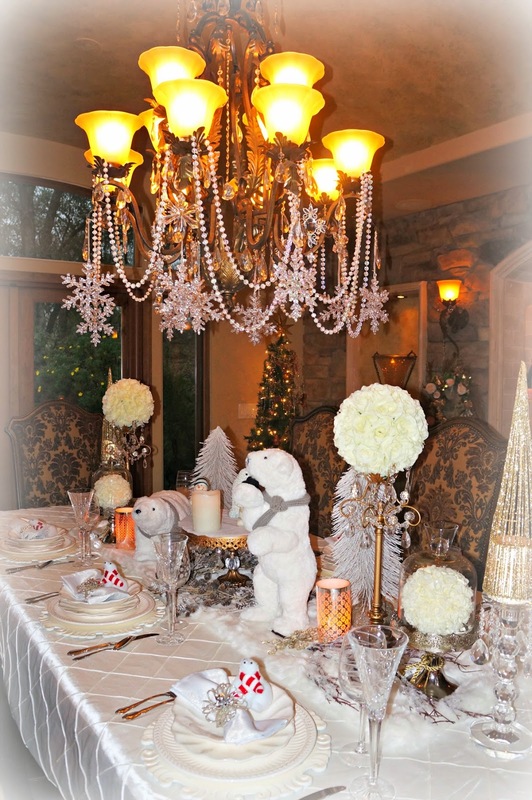 If you missed my Winter Wonderland Tablescape, you can click the picture and it will take you to the post. Merry Christmas to all. Stay tuned for 18 elegant ways to decorate with gold, my Aqua Peacock tablescape and a royal crown tablescape. *I also want to add: Blogger is sometimes showing the word verification on blogs. I have not added it, however there is a glitch right now with many bloggers. Just ignore the word verification. There is NO need to type it in. Hopefully in time, Blogger will fix this problem. On another note, a few bloggers have told me, they can't find the comment box. I have checked this and found out on Internet Explore, there seems to be an issue. If I change the format to full page, then the problem is solved. Please let me know if this is an issue for you. Fun snowman table, Linda. Love the Atelier Athena plates...I have been looking for a grey one for about 5 years...even Replacement, Ltd. can't help! 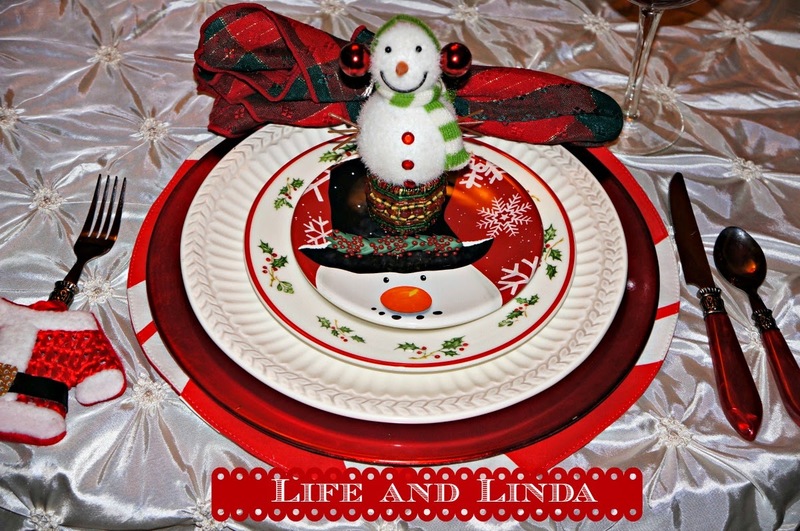 I love your Frosty tablescape, dear Linda! You found some cute times at Big Lots to complete the look. Thanks for the tips with all the issues,too. You're the best! I love your pic at the end of the post...too cute!! Oops, I meant to write "items", but auto correct changed it! LOL! Your table looks just adorable! The snowmen are so cute, and you can use those almost all winter. 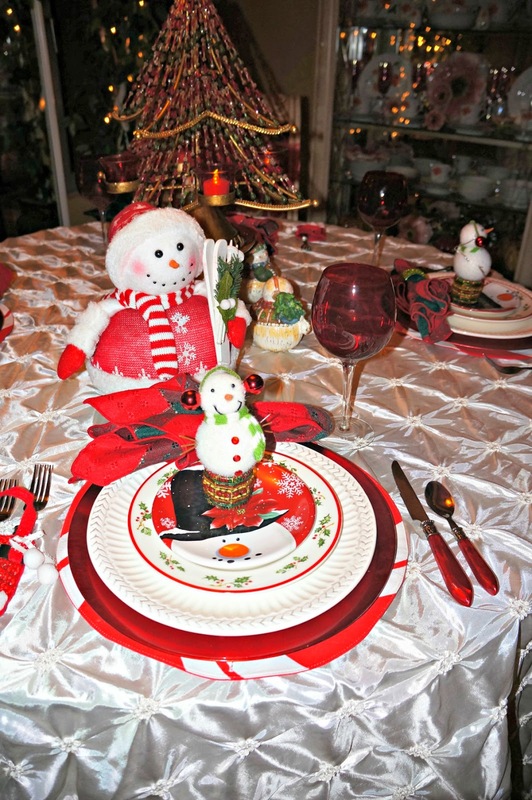 Lovely table setting, I love snowmen too! Happy Holidays to you! What a cute setting, Linda! The snowmen are so fun! You always have the cutest things! Such a cute table and so full of whinsey. Also thanks for the tips. I had noticed that many blogs were having the word verification and I was wondering. Also it was hard to find the comment section on some blogs. What a cute table!!! 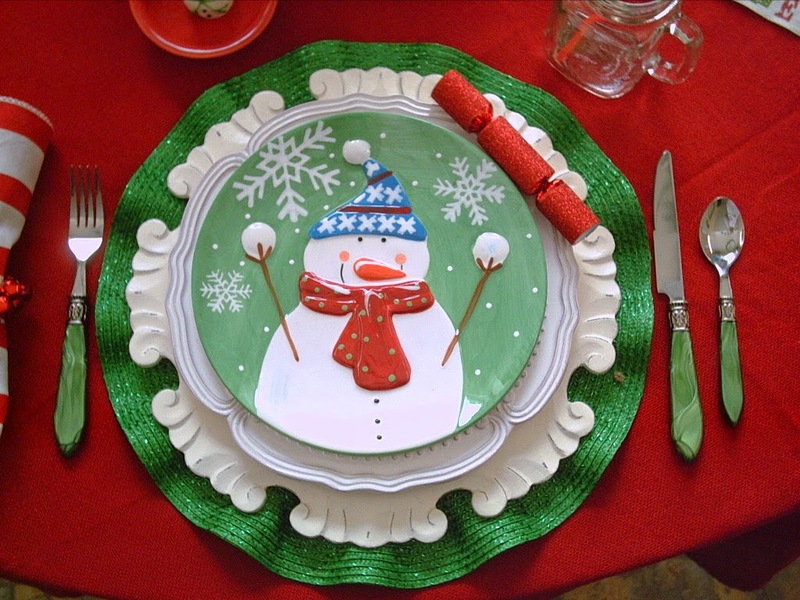 I have a few sets of snowman plates and have got to get a table done! This is such a busy year I am falling behind on posting! Big Lots has some cute things for sure, I was there the other day. Is there anything cheerier than a snowman? I love Frosty the Snowman - it's still one of the Christmas "cartoon" shows I love to watch. So, naturally, I love your lovely snowman dishes and everything about your tablescape! I love it! Looks so festive and the snow man looks happy. You are such a pro at creating beauty! Thanks for the tips re: blogger. I had a weird response earlier when trying to comment and having lots of problems trying to post.Hopefully, it will be fixed soon! I am absolutely going to have to have a top hat! Choosing one will be difficult...I've already chosen 3. :) Must narrow it down to l.
I love snowmen tables - they are so much fun! And this one is no exception. Frosty looks adorable surrounded by the wonderful fun snowmen plates. I like how the smocking in the tablecloth looks like snowflakes. What a cute table! The snowmen plates are adorable and I like the top hat! The tablecloth is like a blanket of snow! This would be so perfect for the grandkids! 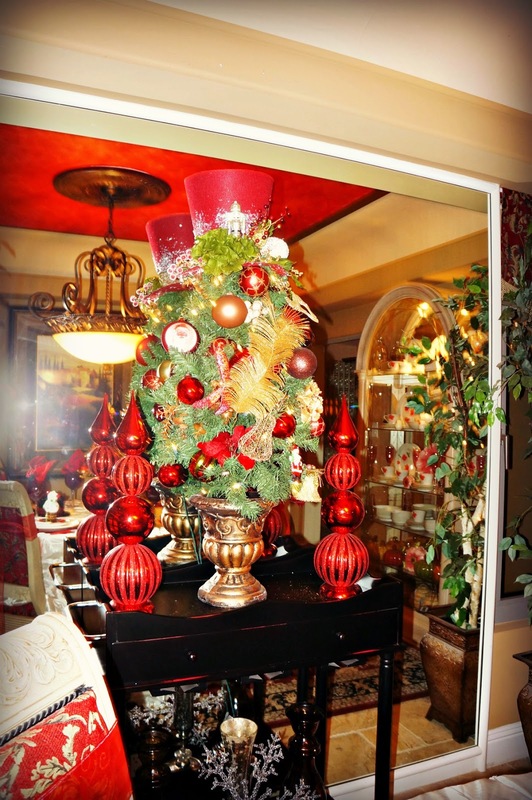 Hi Linda, Love the snowman table and all the special accents to create this darling look. You are so good my friend and put so much love and talent into all you do. Yes, I hope blogger fixes the glitch with word verification. I've ignored it from the beginning and comments just bypass it and go through. 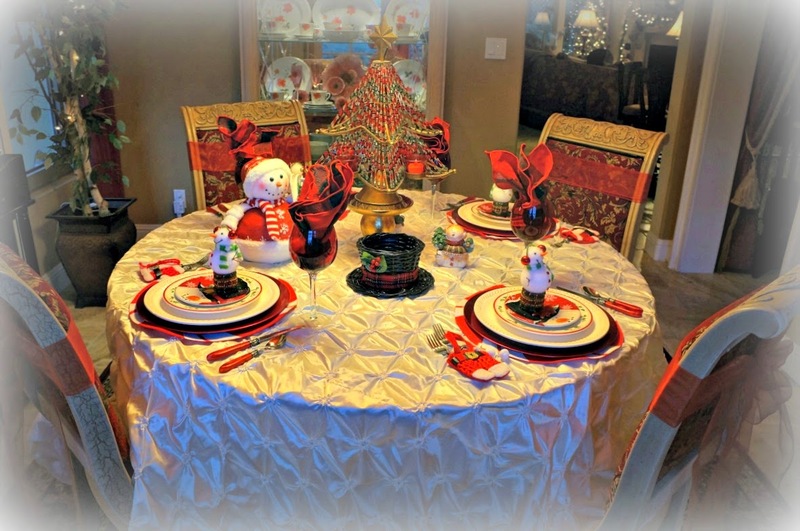 Beautiful tablescape, Linda! You always create the most beautiful tables. Merry Christmas! I love snowmen! So I am definitely loving your Frosty tablescape. Beautiful! Oh, you little cute! Now you're being a snowman! :) I love your tablescape and you certainly know how to do it up right! Cute everything! Oh, these crazy computers! They just seem to have a mind of their own sometimes! I had noticed that pretty much everyone on Blogger suddenly had the word verification thing. I thought it might be glitch of some sort. I hope it is fixed soon for the sake of those who really despise it. I know for sure Kathleen does!!! That was so nice of you to introduce Valerie on your blog! It's always nice to lend a hand to the newcomers. Your table looks great! The design around the dinner plate is a perfect companion to the holly on the other plates!